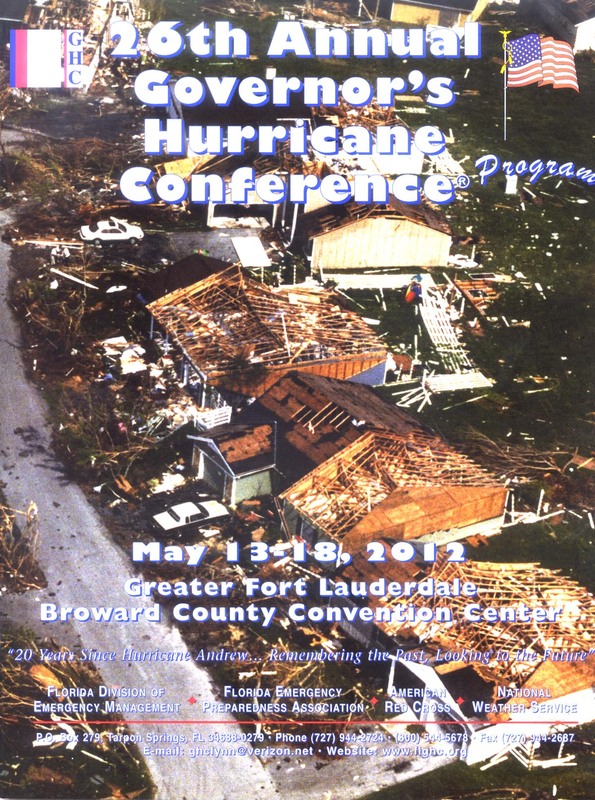 The 26th annual Governor’s Hurricane Conference was held, as it has over the past few years, at the Greater Fort Lauderdale Broward County Convention Center during the week of 13 May 2012. The conference theme this year “20 Years since hurricane Andrew….Remembering the past, looking to the future” was intended to highlight how that historic event uncovered our shortcomings, lack of preparedness and coordination when we had to execute our emergency plan and respond to the disaster that resulted from that, the first named tropical cyclone of the 1992 Atlantic hurricane season, and only one of three category 5 hurricanes to have made landfall in the United States since records have been kept, and how this same event led to significant changes in the way we conduct emergency management, in the way we design and construct our buildings, as well as change in several other important fields. This year’s conference, attended by a record 1700+ participants, including many from several states and 25+ foreign countries, and exhibitors, made many of us who have been involved in emergency management and hurricane mitigation think not only about hurricane Andrew, but also about the very active Atlantic hurricane seasons of 2004 and 2005 that brought unprecedented and repeated impact to all corners of Florida, but it also served to remind us all of how much has changed for the better over these twenty years and, at the same time, how much continues to change even as we met to continue to learn, and share knowledge and ideas during the conference. One of the important improvements that resulted from the impact of hurricane Andrew was the creation, by statutory revision, of the Emergency Management Preparedness and Assistance Trust Fund [EMPATF], which has ensured all counties in Florida receive a base level of funding for emergency management programs on an annual basis. The EMPATF has allowed our state to develop preparedness, response and hurricane mitigation capabilities that are a model for the entire nation, and which allowed numerous communities throughout the state to meet the challenges generated by the 2004 and 2005 hurricane seasons. In contrast with these and many other positive developments generated by changes in the aftermath of Hurricane Andrew 20 years ago, this year’s conference also brought home the sobering fact that many of the veteran emergency managers, planners, mitigators and a cadre of otherwise active participants in the battles with hurricanes, have been retiring creating a loss of institutional knowledge and invaluable experience. This is happening at a time of tough economic conditions at the local, state and national levels, and also at a time when increases in population and urban development have also increased the number of people and the value of property at risk from the impact of recurring hurricanes. So, one of the key messages that emerged from this conference was the need to continue maintaining and enhancing our capabilities, and changing with the times, for the protection and benefit of residents of our vulnerable state. The level of attendance and participation at this year’s conference confirmed, once again, the Governor’s Hurricane Conference as the foremost event of its type in the nation, and the recognized best forum for learning, sharing knowledge and innovations in hurricane preparedness, response, recovery and mitigation. The 26th Annual Governor’s Hurricane Conference featured several key note speakers including Bill Read, the Director of the National Hurricane Center (now retired), and Bryan Koon, the Director of the Florida Division of Emergency Management. The opening plenary session, on Wednesday 16 May, featured a rich and at times poignant panel discussion – the Hurricane Andrew Panel – A Twenty Year Perspective – monitored by Bryan Norcross, which included recognized and respected veterans of the Hurricane Andrew battles Max Mayfield, Frank Koutnik, Michele Baker and Bill Proenza. Ricardo A. Alvarez was one of the speakers during the conference, as a panelist in one of the concurrent sessions titled Current Trends in Mitigation of Essential Facilities, on Thursday 17 May from 3:30 to 5:00 p.m., that also included Jeff Robinson, CEO of Hurricane Protection Industries and also a veteran from the Hurricane Andrew event, and Danny Kilcollins of the Florida Division of Emergency Management. The session focused on recent changes to the Florida Building Code, while also addressing other norms and standards such as the ASCE-7 standard of the American Society of Civil Engineers, the updates to the Storm Shelter Requirements (FEMA 361) and the National Storm Shelter Association/International Code Council Standard ICC-500. Ricardo A. Alvarez specifically addressed was is viewed as a significant gap in design methodology and guidance in current codes and standards, which has to do with storm surge, the most damaging component of hurricanes on the basis of energy of impact and the capability for causing sever, even catastrophic, structural damage to the built environment in the coastal region. Ricardo’s presentation titled “STORM SURGE: A dangerous and neglected hazard” [Storm Surge ABSTRACT] shared several examples of actual storm surge impacts on the coastal built environment, which graphically demonstrated the enormous capability for water for causing catastrophic damage to buildings and infrastructure, not to mention erosion and loss of beaches. This presentation also contrasted how the Florida Building Code and its incorporated standards ASCE-7 and ASCE-24 address the issue of design criteria and calculation of loads from storm surge and wave action, with the approach used for other environmental loads such as wind, seismic and ice. Ricardo shared information about a number of enhanced non-standard design criteria that go beyond required codes and standards, which address the impacts of water, including several design manuals and recommendations from FEMA [Federal Emergency Management Agency], FLASH [Federal Alliance for Safe Homes] and IBHS [Institute for Business and Home Safety], using these examples to advocate a CODE PLUS approach when establishing design criteria for the construction of buildings and structures that are resistant to the impacts of storm surge and wave action. [you can view slides used in this presentation by clicking on the following link: STORM SURGE presentation2]. The conference, as it has in previous years, was sponsored by the Florida Division of Emergency Management, Florida Emergency Preparedness Association, American Red Cross, and the National Weather Service, while also receiving financial or in-kind support from a number of public and private institutions.